For quite some time, you had been asking me about getting your own library card. I told you it was just easier to use mine and keep track of everything checked out that way. You accepted that reason and picked out books and DVDs using my card. Two weeks ago we decided to go to the new library to get some items. While there, the kids computers were not being used. We thought it would be fun for you and JSL to get in some computer time. Do me a favor, please do not tell JSL he has his own card. 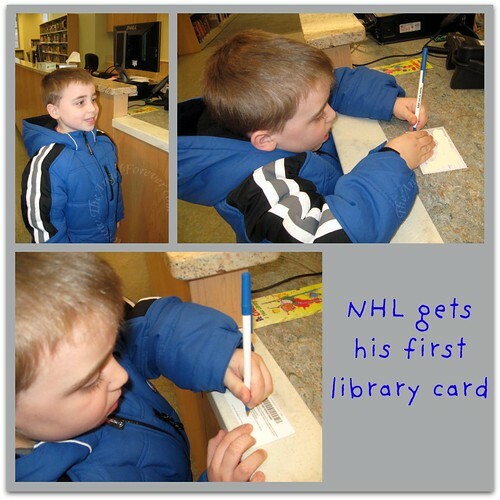 One day when he is your age I would like to capture the moment of him getting a "first" library card as well. The teacher in me thinks that this was a huge moment for you. I still remember when Nana took me to get my first card. I promise we will go back again soon to play games and use your brand new library card. I hope you always keep this love for reading. I am so proud that you have read almost 200 books this year. Keep it up! aww that just brought a tear to my eye. Taylor has a card, when we moved and I was signing up for mine the librarian asked me if he wanted one so we got it. I sort of wish we had waited now. I know its corny, but I just love the library!